Create wonderful memories whilst enjoying lots of fun and ‘hands on’ Farm Activities – animals and play for the whole day with your family and friends! Join in our daily activities including meet the animals, tractor rides, crafts and more. Meet & feed our friendly farm animals in Pets Corner. Cuddle the rabbits and guinea pigs, rub noses with the piglets and visit the donkeys, alpacas and more in the Paddocks. Explore the farm on a tractor ride! 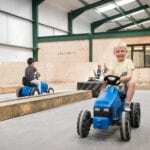 Special themed tractor rides during school holidays, and different activities every month in term time. Let the children run off steam in our Play Areas – Outdoor Adventure Play and Indoor Heated Play! There’s something for all ages including ball pool, sandpit and soft play. Take a walk out past the Animal Paddocks and see the animals there. Pick up an Explorer’s Activity Sheet and find, make or collect on your walk. 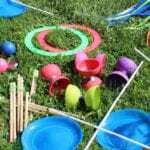 Or try your hand at building a den in the Den Building zone. To check availability and to ask any questions about our Birthday Parties, please contact us using the ‘Check Party Date Availability’ button top right or phone us on 01793 763939. Once we have confirmed availability please submit your booking via the ‘Make a Booking’ button below and call us to pay your £50 deposit to secure your date. We will then send you a booking confirmation via email. Your entry to the farm for as much of the day as you like (9am-5pm) with reduced price entry (as long as your group is more than 15 paying people & your guest list is provided 2 days prior to the party date), access to all the activities including animal handling & animal feeding etc, a tractor ride with all your group together*, a table reserved for two hours for your ‘base’ and for you eat your party food. Optional extras (see details below) include party food boxes (hot or cold), balloons, birthday cake [all subject to additional cost]. A day out with your family and friends! Sorry no party bookings can be taken for Good Friday to Easter Monday, or for any days in December. Children’s parties must be pre-booked, have a minimum of 15 paying people & be paid for in ONE transaction on the day (minus the £50 deposit paid on booking). Please note that socks must be worn by everyone using the Indoor Play Areas. Legally it is required by professional carers that children should be supervised at the following ratios: Under 3’s 1:2, under 5’s 1:4, under 8’s 1:6, and over 8’s 1:8. This does not apply to ordinary parents or grandparents, but is a good guideline. You are responsible for the children and their conduct whilst at the Farm.